What better way to a holiday than in the great outdoors. Plenty of vitamin E, fresh air, light exercise, refreshing turquoise waters, a slight tropical breeze, no crowds, no traffic, coupled with some peace and quiet, and amazing scenery; really makes for an exciting time away from home. What’s even better is when you can combine all these beautiful features with a gulet cruise as well as a biking trip in the Mediterranean of Turkey. You not only have the opportunity to experience the breathtaking natural surroundings of the southern coast but also pack in a good source of oxygen with a delightful biking tour through some of the best nature paths along the Carian coast. To be a part of a bike and barge Turkey vacation such as this is not complicated at all. All you really need to do are three main things for a fantastic bike and blue cruise Turkey holiday. There are very few Turkish gulet cruise holidays that are offered with cycling trips along Southern Turkey. 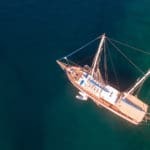 Unless you specifically ask for a private gulet cruise with your bike trip, there are currently none that are known in the local market, that has been professionally pre-planned by experts, except in gulet cabin charters – until now. 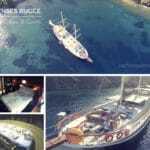 Although gulet cabin charters and cycling trips are lovely Turkish gulet cruise holidays, it’s an altogether different experience to hire your own private boat charter in Turkey and cruise the coastline without sharing your privacy on board with other travelers. Yes, of course, you may meet people and make new friends, however, plan a private yacht charter for your bike holidays is quite special – particularly if you are sharing it with your family and friends. 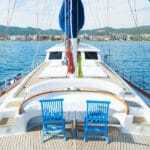 In order to book a private gulet cruise and bike trip combined, there are a few steps to make it simple and smooth. The steps are easy. First, you choose your itinerary. There are three great ones to select from. 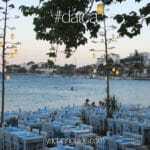 All of them are located on the Carian coast of Turkey and embark either from Bodrum or Marmaris harbors. Both coastal cities offer easy airport transfers to your private boat hire; as it takes 40 minutes from the airport to Bodrum and about an hour and a half to Marmaris. Both places are exciting seaside cities to start your trip from. Should you arrive early enough or after your travels, have the time before you leave for the airport, you might capture the chance to go and do a bit of sightseeing as the harbors are located in the city center. Once you have chosen your preferred itinerary, it’s time to pick a yacht for your cruise. Generally, these types of holidays are well spent aboard Turkish gulets. Gulets offer that traditional Turkish cultural feel to the whole trip. From the gulet boat to the cuisine and crew, it’s simply a classic Turkish style Mediterranean boat cruise. However should you be keen on renting a motor yacht instead, that can be possible too! There are an array of yacht charters to choose from for all price ranges. When you are choosing a yacht for your bike and blue cruise holiday, be certain of how many will be in your group, also have an idea of how much your group can allocate for the one week trip. Keep in mind that the bike trip is one price and the yacht rental is a separate price. If you can figure out a budget, then an agent can shortlist boats that will near match your price range to match your chosen itinerary. Also, the bike trips are priced based on 2 or 3 days (depending on the route you have picked) for ” number of guests – and quite reasonably priced too. Should you book a gulet or a motor yacht during the early booking season, you might have the chance to receive an early booking discount as well. The last of three steps is the most important. Have a great time! With so many wonderful places to visit by land and by sea, you can be certain that other than being an easy going and flexible style holiday, it will also offer plenty of good times as well. Try a blue cruise Turkey biking vacation this season!